Department of Membership Affairs is one of the most important departments in Dhaka Stock Exchange Limited. This department of DSE runs with the goal of providing possible assistance to all the DSE Member Companies in their smooth operation. In the year 2006 the total number of active DSE Member Companies was 120 with a few branch offices. But in the year 2009 the number of active DSE Member Companies has come to 285 with 500 Branch Offices (on October 2009 existing 381 and proposed 120) and the total number of Authorized Representatives has reached to 2475(on October 2009 existing 1692 and applied 525). As a result of such expansion and up gradation of DSE, the activities related to membership affairs increased by a considerable degree. Registration of Stock broker and Stock Dealer. Approval of the existing branch. Approval of the extension branch office. Withdrawal of the authorized representative. Renewal of the authorized representative certificate. Issuing stock broker and stock Dealer certificate. Renewal of stock broker and stock Dealer certificate. Issuing of trading work Station. This department focuses on collecting necessary document and after sorting all the document, complete set of the document go to due authority for final approval. Complying Rules and regulation the department arrange document for final approval. The department always remains alert to fulfill DSE member’s requirement. Membership of DSE facilitates a person prospects to be a Trading members (Stock Brokers) of the Exchange through compliance of the regulatory Provisions of DSE and SEC. There are 238 members in DSE all of whom are corporate bodies. A corporate body with a minimum paid up capital of BDT 2.5 million. If someone is eligible to be a member of DSE, he/she thereby may apply for the membership of DSE. The interested party must have to issue a forwarding letter and submit the necessary papers and documents to the DSE. The forwarding letter along with the name of all the documents is given in the following page. After sorting the documents the department needs to send to the Securities and Exchange Commission for license. DSE announce the license through MOP’s Announcement for starting of trading depicting the license number and other details. Then it needs to register the office or location where they want to start trading along with allocation of TWS applied for. The Board of Directors Date:………………. I on behalf of——————————————————————————- Ltd. desire to be a shareholder and member of the DSE Ltd. and I hereby agree, if selected for the same, to be bound by the Memorandum and Articles of Association of DSE along with all the laws, Bye-laws, and Regulations made or to be made hereafter for the Governance of the Exchange or the business thereof. We herby apply for one share with particulars given below as required by DSE. A. Additional requirements FORM duly filled in & signed. B. Terms & Conditions to be a member of DSE duly filled in & signed. C. Recommendation for membership from two existing members duly signed. Original Share Certificate # 000——— along with share transfer FORM 117 (duly filld in & signed) and Share transfer stamp of Tk. ———– duly cancelled by company’s seal. DSE Members Club Membership Fee of Tk.100,000 (one lac) paid Vide Cheque # ———– date ———————— of ————————————– Bank ———————————————- Branch Dhaka. Renewal fee by way of PO/DD of Tk. 10,000/= in case of Stock Broker and Tk. 20,000/= in case of Stock Dealer & Broker in favor of SEC. In case of Stock Dealer & Broker one set and in case of Stock Broker two sets of duly filled in Form ‘Gha” and Form ’Chha’ (enclosed). Statement of Net Capital Balance of the year ending month. According to sub-rule (2) of the above rule, the application along with documents must be reached to the SEC within one month before expiry date to avoid daily fine Tk. 500/= for any late submission. Ownership of DSE membership may be transferred in many ways. The Department prepares documents in this regard and maintaining a database with every details of such transfer or any kind of change. The database provides the updated information from its birth. The documents that are used For Registration of Stock Broker/Dealer are also used for transferring the Membership of DSE. As per SEC’s requirement every DSE Member Company (Proprietorship Company) has to be converted into limited company. The Department has completed all arrangements for 150 proprietorship companies to convert into limited companies. DSE broker/dealer may appoint Authorized Representative who is registered with DSE and SEC to act as an agent for doing all the activities related to buy and sell securities through the stock exchange. Forwarding letter regarding appointment of Authorize Representative. Four copies (Passport size) recent Color Photographs. N.B. Computerized photo is not allowed. A Declaration of having SEC License under either DSE or CSE along with Job Record being authenticated by the Member Representative. Convicted Clearance Certificate as per law of 2000, 4(2), (v), (VI) by SEC. Affidavit on Non-Judicial Stamp of Tk. 50/= with notarize. A Deed of Agreement between the Member & Authorized Person on Non-Judicial Stamp Tk. 150/= (Both the parries should Sing in every page). Form Kha should be filled in Bengali properly. A cheque of Tk. 1600/= in favor of DSE Ltd.(Entrance fee Tk. 1000/= & Training fee Tk. 600/=). A pay Order of Tk. 1000/= in favor of SEC as registration fee. a) Applicant’s age should not be less than 21 years (As per S.S.C. Certificate). b) Minimum Qualification of Applicant is H.S.C. c) The name & father’s name of the Applicant in every relevant document should be as per S.S.C. or Equivalent Certificate. d) If the applicant has SEC License, he has to submit the Original License along with the clearance from the previous Member Company (Release order). Yearly Audited Financial Statement within four months of the year end. Quarterly Un-audited financial statements within one month. Discloser of price Sensitive Information. These statements have to submit as per the Securities and Exchange Commission (Stock Dealer, Stock Broker & Authorized Representative) Rules, 2000. It is mandatory to follow preparation of the Financial Statements according to IFRS and ISA’s as adopted in Bangladesh. The reports submitted by the companies have to be checked by the DSE experts and forwarded to the commission within the stipulated time. Renewal fee by way of PO/DD of Tk. 1000/= in favor of SEC. One set of duly filled in Form ‘Gha” and Form ’Chha’ (enclosed). Statement of Net Capital Balance of the year ending month of the respective company. According to sub-rule (2) of the above rule, the application along with documents must be reached to the SEC within one month before expiry date to avoid daily fine Tk. 100/= for any late submission. All the related information of the DSE Member Companies and Authorized Representatives are given in the DSE central database and website. This information is modified time to time. Office– The proposed branch office must have to be outside of the 500 yard distance from the Head office of Members. The Member Company must have a Compliance Officer, A Branch Manager, and Two Authorized Representatives. It is to be noted that a compliance officer can be a branch manager, but can not be an authorized representative. The branch offices of the DSE Member Companies require submitting to the commission for approval. Now the total number of branch offices has reached to 500 (existing and proposed) for the approval. Forwarding letter to DSE for opening branch office. Name of the Member Company (corporate profile). Address of the head office and Branch office(s), if any. Address & telephone no. of the proposed branch office. Fax no. & email address of the proposed branch office. One copy of latest audited financial report. Names, address and qualification (Detailed CV) along with appointment letters of the authorized representatives, branch manager & compliance officer being attested by the Representative of the Member Company. Board resolution regarding opening the proposed branch office. Photocopy of Deed of Agreement between the member company and the owner of the premises duly attested along with layout. Evidence or proof of having connections of utilities, such as demand note, receipts from authorities from which connections were taken. Bank account number of the proposed branch office and name of the bank. DSE issued a letter to the respective member company to confirm the approval of Branch Office. Two copies of the letter are also issued to IT and Monitoring department to take further necessary action for branch approval. Then DSE issued a letter to SEC to inform about the approval of branch office and also updating the Member Database and In-house information. The files of the DSE member companies are preserved in the safe custody with updated information by weekly basis. 12. Compliance as SEC (Stock Broker/Dealer and Authorized Representative) Rules 2000. 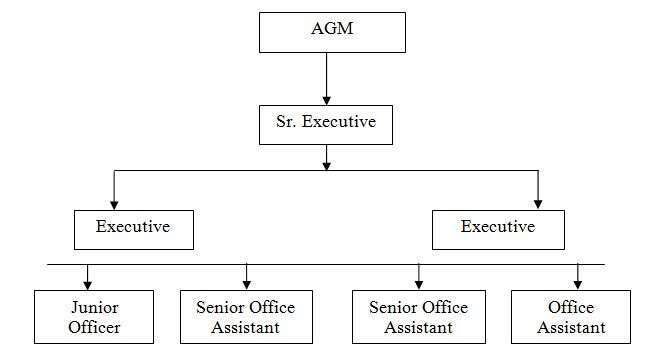 The department follows every order of the Chief Operating Officer and Chief Executive Officer at once. It needs to go with the Honorable Members when needed. We are intending to look after whether the DSE Membership Companies are following different corporate formalities. Different formalities such as, employment of Auditors, arranging of EGM, AGM, Board Meetings timely, various formalities relating to the Office of the Registrar of Joint Stock Companies and Firms and some other related tasks. Bio-data with passport size photograph of new Membership Representative. Latest Form XII (Particulars of Directors) being certified by Registrar of joint stock companies and firms. Photocopy of Appointment Letter of new Membership Representative. Guarantee and Undertaking in original on Non-Judicial stamp of Tk. 150/= of new Membership Representative. After sorting the documents DSE decides to change the Membership Representative of the respective member company. To perform as per the orders of the High Officials time to time. The DSE Member Companies have 381 branch offices in total. The Securities and Exchange Commission has circulated a Directory; SEC No. SEC/CMRRCD/2002-90/34 dated October, 2009. As such, we require sending various related documents for the compliance. The Circular has a time frame within which the said compliance should be fulfilled. Authorized Representative This Section plays a good role in the capital market. It produces Authorized representatives who operate the workstations in their respective Brokerage Houses. It has various jobs of multi dimension in nature. The applicants applied with relevant documents are required to appear in the Interview Board. After doing positive they are required to have a Training jointly organized by SEC and DSE. Then the documents are sent to SEC for registration. This section is new one. It will look after the compliances of the Stock Brokerage Companies regarding their corporate activities. In this regard it will monitor whether the companies are doing EGM, Board Meetings and other Joint Stocks and firms related jobs. This section also will look after the submission of audited Financial Reports for onward submission to SEC as per the SEC rules and regulations. This is an important section as well. It looks after the various daily affairs of the Member Companies such as, allocation of Trading work Stations, withdrawal of Authorized Representatives, different announcements, suspension of trading & TWS and various related jobs. This section deals with data entry in the DSE’s Central Database, websites and other related links. The changes of DSE Member Representative and other changes are given entries into the different links. This section deals with renewal of Membership licenses, authorized Licenses along with application for new approval of License to SEC. As per the SEC rules and regulations the renewal processes have to be complied with defined time frame and specific charges. Form “Ka” and “Cha” – Registration for Stock Broker/Dealer. Form “Kha” – Appointment of Authorized Representative. Form “Ga” – Registration Certificate. Form “Gha” and “Chha” – Renewal of Stock Broker/Dealer and Authorized Representative’s Certificate. The Capital Market is becoming larger day by day with the increase of Member Companies as well as Branches in countrywide. So the activities of Membership Affairs department are increasing rapidly. During the year 2007-08, DSE earned a total revenue of Tk.42.410 crore as against Tk. 18.84 crore in the previous year and a total expenditure of Tk. 16.94 crore as against Tk. 11.01 crore in the previous year leaving an operating income of Tk. 25.48 crore as against of Tk. 7.33 crore in the previous year. In addition during the year 2007-08 DSE earned a net interest revenue of Tk. 1.57 crore in the previous year leaving a net profit of Tk. 35.84 crore as against Tk l8.89 crore in the previous year. Dhaka Stock Exchange performance from March 2004 to February 2009 is shown below through the graph. On an average the stock market has been rising. Except in the year 2005, the market was booming. But from the year 2007 the marker is increasing. Investors are aware of their investment. They judge the potentiality of companies. From any time in the past the investors are more concern about their investment. Besides listing in the stock market for good companies including banks created a huge response from the investors. That also indicates that investors are ready to invest their money in good companies. DSE has three major indices to reflect market behavior namely DSE All Share Price Index, DSE General Index, and DSE 20 Index. All share price index (DSI) is now the benchmark price barometer. The stock market barometer registered a downward trend during the period of November 2008 to October 2009 in the DSE General index. Though its go up during mid November, 2008, again it moves downward trend and fluctuate up to end of October 2009. The DSE 20 index has the basis of 700 base-indexes. The DSE 20 index stood at 2200 points and DSI index stood at 2800 points. On the other hand DSE GEN index stood at 3300 at the month of October, 2009. Then started to decline & continued few months & again increasing. Financial sector dominated the DSE turnover, accounting for a 27.39 percent of the total DSE turnover in October, 2009 with Bank stocks on the top while manufacturing sector contributed second highest turnover with Engineering sector contributed for 12.32 percent. In volume wise, Investment companies took the lead while Pharmaceuticals, Food and Textile sector followed the rally. In terms of value, Bank, Pharmaceuticals and Fuel & Power, Textile and Engineering Sector dominated the DSE turnover, accounting for 17.74 percent, 8.80 percent, 19.18 percent, 10.92 percent and 12.32 percent respectively. Market Cap in bn Tk. These are the key market indicators of Dhaka Stock Exchange (DSE) for 2004 to 2008. During the said time, an increasing trend was appeared from the value stated in table. This scenario will be clearer through following graph. 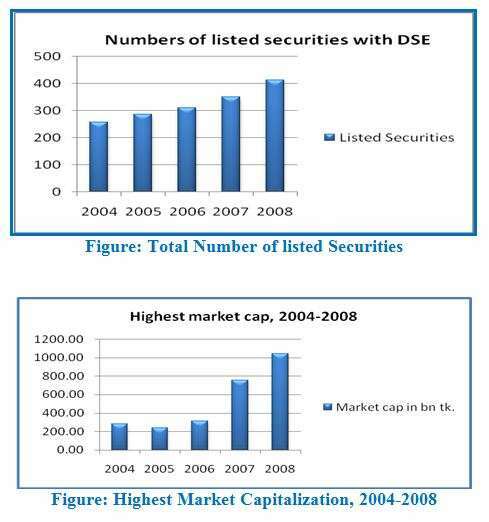 The numbers of listed securities of DSE in increasing at increasing rate over the year. In 2004, it was 256 and in 2008 it arrives at 412. From the following graph (figur-2), we can see market capitalization has tremendiously increased in last two year. The highest market cap in 2006 was tk. 315 billion but it was tk. 758 billion and tk. 1044 billion in 2007 and 2008 respectively. Finally in recent time, at 19th March, 2009 DSE made the peak with turnover of tk 648 crore. Price – earnings ratio, which theoretically determines the time an investor, needs to get back the investible amount, reflect the price offer per taka against the earning of a company share. DSE generally calculates two types of P/E ratio. A total of 128 companies and mutual funds have declared cash dividend in 2008 against 141 of 2007 during the year under consideration. The cash dividend status of the companies and find shows that 3 companies declared more than 100 percent dividend, 7 companies declared 51 to 100 per cent dividend, 4 companies between 31 to 50 per cent and 21 companies in 21 to 30 per cent, 58 companies in 11 to 20 per cent while 35 companies declared below 10 per cent. Sector-wise average dividend distribution shows that 7 sector paid higher dividend in 2008 compared to in same period of December 2007, with the tannery sector 64.16% taking the lead while 9 sectors paid lower dividend during the year compared to the preceding one. Central Depository Bangladesh Limited was incorporated as a public limited company on 20th August 2000 to operate and maintain the Central Depository. It will provide following support to the stock market/investors. Electronic Book Entry, recording and maintain securities accounts. Registering transfer of securities: changing the ownership without any physical movement or endorsement of certificates. Execution of transfer instruments, as well as various other investors services including facilitation of the secondary market trading of Treasury Bills and Government Bonds issued by the Bangladesh Bank. To trade under CDS one should have an account. This account is known B/O account. It is like a bank account. The owner of the account will get an account number by which he/she can get his balance of shares at the office hours. The following materials required to open an account. Power of authority, if required. It is the process to convert physical shares into electronic shares. For this conversion electronic book entry is mandatory. It is a form that acts as a cheque. Normally, the process of transferring shares from B/O account to clearing account is called pay in. When the B/O sell his shares then he signs in the pay in form. The rocess of transferring shares from clearing account to B/O account is called pay out. It is a process to transfer shares to the purchaser account. The clearing and settlement is same as physical shares. The process of converting electronic shares to physical shares is called Rematerialization. By converting physical certificate into electronic form will eliminate-the risks of damaged, lost, forget and duplicate of share certificate. The core services of depository are the efficient delivery, settlement and transfer of securities through computerized book system. Immediate transfer of ownership is possible through electronic book entry. This system also helps lending organization to check collateral if it is shares. It also helps parent organization to issue IPO’s, bonus shares, and/or right shares quickly and conveniently. It also saves expenditure of issuing company from printing physical share certificate. Very costly technology is required. Fully depends on power supply. Full concentration is required always otherwise share may be transferred to other DP. Easily can cell the share of any B/O by others, if anyone can copy the sign of any B/O. Fully depends on computerized system that may crash any time. To use updated programs and software. To work with full concentration. To provide uninterrupted power supply. 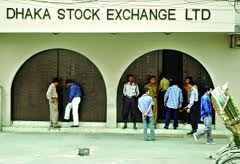 Information was not sufficient in Dhaka Stock Exchange. Its trading activities was not sufficiently transparent and efficient. It lacks breadth and depth. The unwillingness for providing the flow of information by the Dhaka Stock Exchange. Insider trading and off-loading of shares by the directors of the company. Influx of new and unsophisticated investors and speculators. Impact of withdrawals of lock-in period causing a remittance of resources. The jurisdictional roles of various regulatory agencies are not defined. Code of ethics not being followed and dubious role-played by professionals Chartered Accounts in certifying financial statements along with the valuation of assets properties. According to the investigations eight brokers were involved in the manipulation. Some dealers were also involved. The Bangladesh branch of Hong Kong. Company was involved in the stock market manipulation. The trading was not efficient. In the period of trading activities were not transparent. In that time it lacks breath and depth. Its regulatory mechanism either self-discipline or by regulatory agencies were not very effective. The jurisdictional roles of various regulatory agencies were not well defined. Ensure proper audit of the financial statements of the companies by the qualified Chartered Accountants. Ensure full discloser of the4 financial information of the listed companies within frequent intervals. Make financial transactions smooth efficient and prompt by computerization. The general characteristics of the skill market do not exit here. The demand and its controlling management system of securities influence the skillfulness of market. But they are not very satisfactory. Lack of confidence of the new investors. The devastating fall down of share market in 1996 has shattered the confidence of the new investors. Thus, the challenges ahead for Bangladesh stock market are to revamp the share market by restoring confidence among investors. The stock market bubbles up but such rises in the share prices are not consistent with the share market fundamentals. The tax structure of our country is complex. Some times companies hide their real income because of sickness of industrial sector. As a result, the potential investors can’t take appropriate investment decision because of hidden income. In our country the industrialists suffer a lot of problems. They lost their eagerness for the unequal market positions. As a result, the rolling of capital decreases. The flow of foreign investment in our country is not satisfactory. But foreign investment is essential for development of stock market. The demand of capital is increases if the sufficient creative entrepreneur exists. But we have want of creative entrepreneur. For active stock market high quality of stock is essential. But most of the listed companies are in bad position. The following guidelines may be helpful to boost up the stock market in Bangladesh. Set up training center for the newly investors in the share market to reduce the risk of the capital market. To make the rule easy for paying the income tax. Influence the foreign investors by proving the extra facility. To make the market easy for product marketing. To make the market active by marketing the industry strong. To provide training for the present as well as potential entrepreneurs. Strengthening the Securities and Exchange Commission. To make the easy rule for the establishment of the industry to increase the rolling of capital market. To make rule so that high quality securities are bound to come to stock market. To provide tax benefit of the listed companies in order to encourage none listed companies to be listed with the stock exchange. Enhancing bond market through bringing in government and municipal bonds beside the corporate bond. Enhancing greater degree of transparency in financial discloser for better corporate governance. Initiating the process of-creating derivative and future market. Making the market competitive from regional securities market perspective through ensuring market friendly rules and regulatory framework. The role of Dhaka Stock Exchange Limited has been remarkable in recent rears. It has gained the confidence of public and is able to attack more and more funds. At the end of the last decade what was impossible has now become possible and any company listed with Dhaka Stock Exchange can expect to raise sufficient funds through it. The Dhaka Stock Exchange has been able to attract a sufficient volume of foreign funds and the number of foreign investors is growing day by day. If this trend continues Dhaka Stock Exchange market will be efficient one in the near future. at the end of the year 2010 Dhaka Stock Exchange is expected to become one of the major stock market in this region. So far we have observed that Dhaka Stock Exchange has suffered from ups and downs and it can be attributed to the efficiency of the members and some of the consistent policies of the government with more experience. In the coming year in dealing with such busy capital market both the Dhaka Stock Exchange members and government policy makers are expected to be more consistent in their practices and policies. Their product role in the future will certainly be a major factor in the performance of Dhaka Stock Exchange.